Kid-Friendly 3-Ingredient Cherry Jam Recipe! March Break is right around the corner and if you are not heading to the beach and staying closer to home, you’re going to have to keep the kids busy and entertained. The girls have always shown interest in cooking in the kitchen and, when we have time to get in there together, I take advantage of it. The best part is that they are learning useful life skills and get a feeling of accomplishment while they do it. 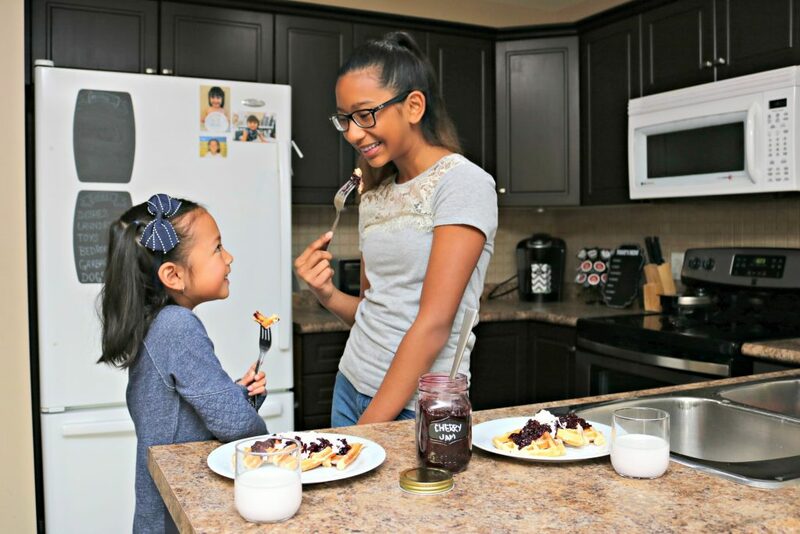 March Break is the perfect time to try new recipes and, odds are, when they are making their own snacks or meals, they are more likely to eat them. I love seeing how happy and proud the girls are of their culinary creations. Once you let them loose in the kitchen, you’ll be amazed at how creative they can get. One thing that I enjoy is canning and making homemade jams. While the results are delicious, it can be time-consuming and not as exciting as one would think. Well, at least not to kids who like to see progress and not just wait around until jars boil and set. How about making a jam with kids that they can enjoy in less than 20 minutes? Yes, you read that right! It is an easy recipe that sets quickly and can be enjoyed sooner than later. How about making a jam with kids that they can enjoy in less than 20 minutes? Yes, you read that right! It is an easy recipe that sets quickly and can be enjoyed sooner than later. You can head to Walmart to pick up everything you’ll need but, guess what? You’ll only have to pick up 3 ingredients. Since a 600g bag of Great Value Frozen Fruit retails for less than $5, it’s inexpensive to make too. The other two ingredients are Great Value chia seeds and Great Value maple syrup! We decided to make cherry jam because cherries are one of our favourite fruits. Not a fan of cherries? No worries. Great Value Frozen Fruit, exclusive to Walmart, also comes in blueberries, raspberries, strawberries or mixed berries. Don’t forget to bring the kids along with you on your shopping trip. They love to be a part of the whole process and picking out the ingredients only builds up the excitement. It also prepares them for the future. I always tell them that, because when they’re grown they’ll know how to shop for ingredients to make recipes at home on their own. March brings about rainy days and maybe even snow days, it all depends on where you are. Some of our favourite activities to do on days like those are to get busy in the kitchen. 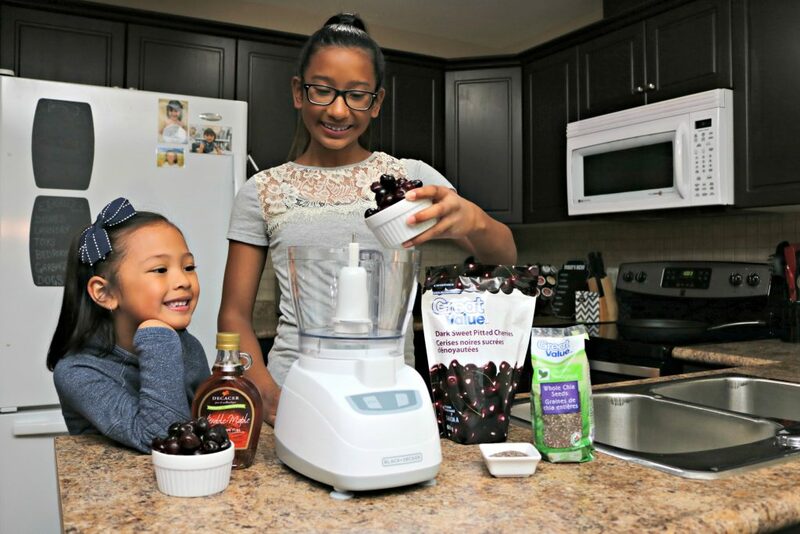 The girls prepared the cherry mix by adding the thawed cherries to a food processor and pulsing them until they were broken up but, not pureed. They then added the cherries to a saucepan and let it simmer. Gabby took the reins and simmered the berries and Mimi added the syrup and chia seeds and stirred until combined. We decided to add 1/4 cup of maple syrup to the cherry jam, because we like our jam on the sweet side. If you prefer less sweetness, use less syrup or none at all. Once the girls placed the jam in a mason jar, it started to cool. We left it to cool overnight and we were ready to enjoy it the next day. You can start to enjoy it as soon as it cools down. Plus, it can be refrigerated for up to 10 days so; you can enjoy it anytime afterwards. “Br-inner” is one of our favourite meals and we love preparing breakfast for dinner as often as we can. 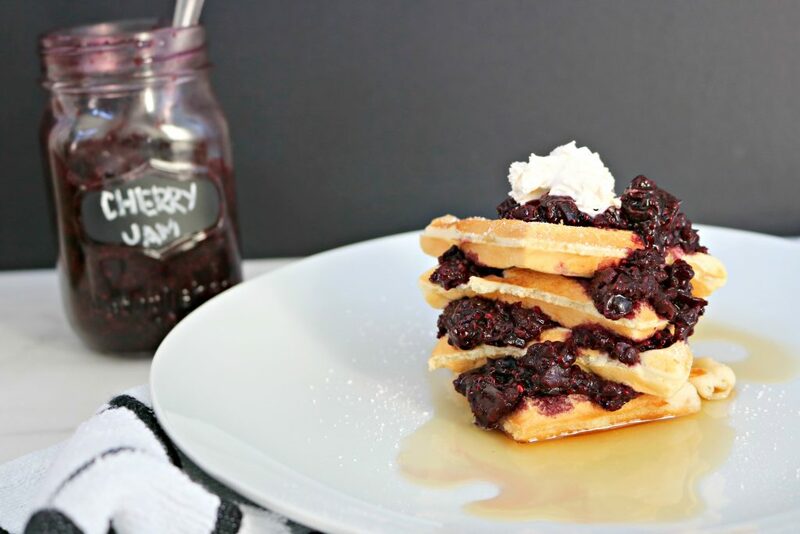 Making waffles and topping them with our delicious cherry jam was a no-brainer, right? 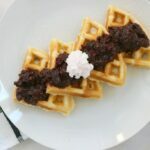 We prepared our waffles and topped them with our cherry jam, a bit of powdered sugar and whipped cream. Totally optional, of course! A delicious sweet and tart homemade jam made in 10 minutes! In a food processor, pulse thawed cherries a few times until they’re broken up but not puréed. 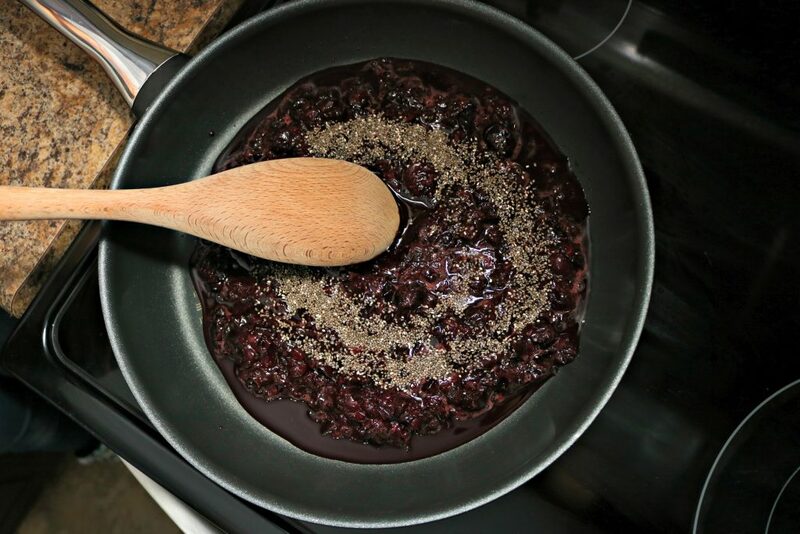 Transfer to a small saucepan and bring to a simmer over medium heat. Simmer for 5 minutes and remove from heat. 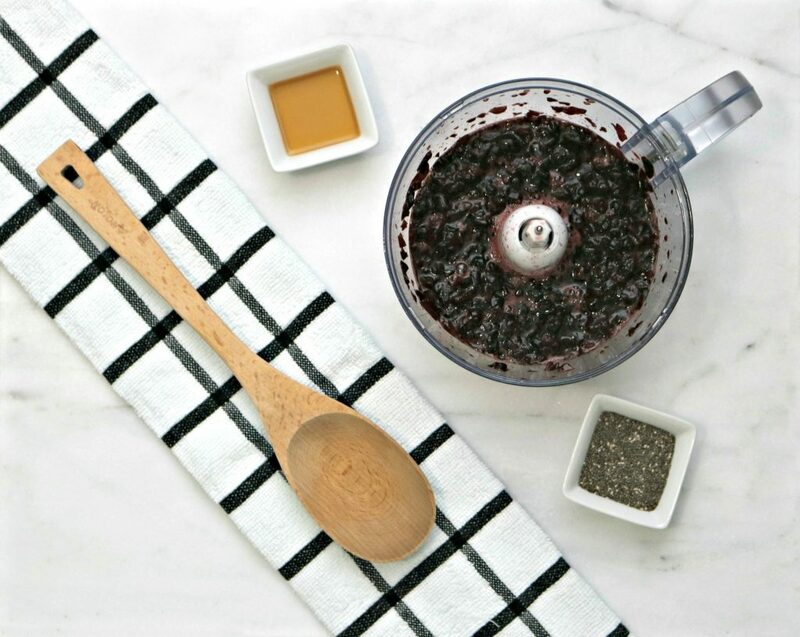 Stir in chia seeds and maple syrup and transfer to a container for serving. Jam will set as it cools to room temperature. Cover, refrigerate and use within 10 days. Yields 1.5 cup of jam, enjoy! Needless to say, the girls were amazed at how easy it was to make jam. It took minutes and they were proud that they did it themselves. The best part of cooking in the kitchen is enjoying the “fruits” of your labour afterwards and that they did! I even overheard Gabs and Mimi discussing that if making jam is so easy, they can literally make any kind. They already have plans to make mixed berry, strawberry and blueberry. I think I have bonafide jam-making machines now and I’m not mad at that! Make sure you head over to Walmart to check out the Great Value selection and plan out your next rainy day or March Break activity. You can even make your own homemade fruit roll treats with the frozen fruit and maple syrup. Have you ever made your own jam before? Previous Post: « Why Shopping at Food Basics Just Got Easier for Everyone + Giveaway! Yummy,thanks i would love to try this !! Oooh yum! I have never had cherry jam before, but it sounds amazing. I must try it. You totally have to try it now! OH how delicious does this jam look! I could see it over some ice cream or even in pie! Yes, those are great ideas for jam! I have never tried cherry jam! I think this recipe looks simple enough to recreate! Very simple Amy, you would be surprised. My kids love getting into the kitchen too! I’ll have to share this recipe with them so they can whip it up for family breakfast on Sunday! Lots and lots of jam! I love cherries and your jam recipes looks so easy and fun to make. Delicious! That is so cool you can use frozen instead of waiting for fresh cherries to come into season in summer. Yes, and it turns out great! What a quick and easy recipe. I haven’t made cherry jam before but now I have got to try it. This looks delicious! I would love to make this with my kids! It is so easy, they can make it for you! Sounds really good and easy to make, will have to try this out. Love cherries! Super easy and it is pretty yummy! I made this in the am for the grandkids and they loved them,it’s all about the presentation for them if it looks yummy they want it ! OMG, I am so happy to hear that! I love jam, but I’ve never made it before. It looks fairly simple to make it! This type is super simple. I’ve never made jam before, never knew it was so easy… I guess this will be something I do on the regular : ) I love how easy it is to make, thanks! It’s true! They are more likely to eat things they make themselves. I love this. Those waffles look Ah-mazing! Thanks! It is so easy. That looks delicious! My husband loves cherries (so much so I bought two cherry trees for our backyard!)! I’ll have to keep this recipe in mind for when we grow our own! Yummy! I love homemade jam. I will have to try this recipe, thank you. Thank you for this! I am a jam fanatic! I love spreads, jams, and jellies! I have always wanted to make my own too! This sounds good. Would probably make a good pie or homemade poptart. Only three ingredients? I want to make this with the twins. I’m sure they’ll have loads if fun. This recipe for the 3 ingredient cherry jam is something I am going to have to make for sure. I have never made cherry jam before or had my niece’s kids help me make jam. This would be a great recipe to make with them . Thanks for sharing the recipe. This looks great! We always make our own jams and jellies, I would like to try a cherry one like this, sounds great! Wow! It looks yummy and delicious! I love it. I would love to try this. Awesome, give it a whirl. Yum, that looks so good. I think it is awesome that you got your daughter involved in making this cherry jam. It is a great skill to teach the kids. It’s always nice to get the kids involved in the kitchen. This sounds delicious, will have to give this a try! Awesome, hope you enjoy it. My daughter loves jam! I bet she would love it even more if we made it together. OMG, yes, she totally would. What a wonderful recipe! I’m especially glad because it uses all whole food ingredients and no added sugar. We’re huge jam lovers at our house and slather it on everything from pancakes to toast. Thanks for another great recipe! Hehe, that is awesome. Enjoy! I’ve never made jam before! This is definitely worth considering. I’ve never tried making my own jam. But now that I know how easy it is to make, I will have to make one soon. Thanks for the recipe! How nice that these yummy-looking treats are done by the kids! That looks delicious too. This a fun activity for the kids, and the jam looks delicious. The girls are adorable. Wow! Jam is very delicious! It looks so yummy and delicious. Fantastic! It taste so good and very easy to make!